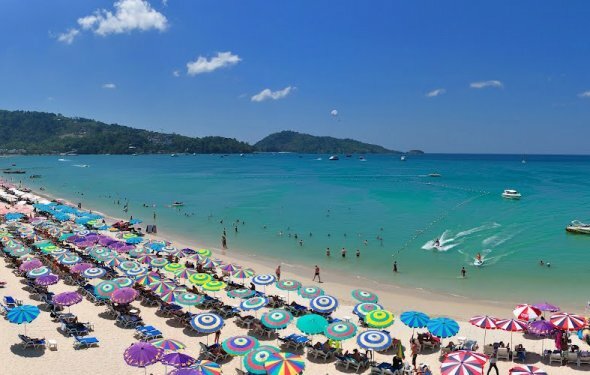 Patong Beach is an astonishing combination of breathtakingly beautiful white sand beach edged by the glittering Andaman Sea, and the most concentrated area of tourist accommodations, shops, nightclubs, restaurants and attractions. If you want action, this is where you will find it. During the day enjoy all the beach-type activities from sunbathing to beach volleyball. Pirate's Cove mini-golf is near the south end of Patong on Rat Uthit Rd. Restaurants abound featuring every type of cuisine from seafood, noodle and rice vendors along the beach promenade to French cuisine at Le Croissant on Bangla Rd, Mexican food at Viva Mexico south of Soi Post Office, Indian food at Tandoor on Soi Kepsup and Italian at Da Maurizio's up on Kalim Bay. At night the area rocks with music ranging from Tommy Doyle's piano keys at Baan Ram Pi and the neighbouring sounds of a jazz band down into the heart of Patong near the intersection of Thawiwong and Bangla Road over to Rat Uthit. For real night action head for the area around Bangla Rd and Soi San Sabai. For dancing there's the discos and clubs like the Banana Discotheque and the famous transvestite show is found at the Simon Cabaret. Soi Sunset has clubs that don't even get started until midnight.